In this post, I'm going to review the PassiveID features of ISE that are new as of ISE 2.2 and 2.3. In this particular post, I'll be doing it all from ISE 2.3 but bear in mind that you can do all this from ISE 2.2 as well. In ISE 2.0, there was a feature added called EasyConnect which utilized WMI logs from the Active Directory Domain Controller to check for login events. Based on those login events, ISE would make a decision to grant access. This allowed ISE to grant network access beyond the typical 802.1x and profiling methods. This functioned well but required a LOT of backend work to prepare Active Directory to share the WMI logs and if you read my earlier post here, you will see what I mean The creators of ISE decided to revamp this process and create a better way to do this in ISE 2.2 and later. For #2, I will expand on that: In the past, ISE had to see an authentication to share the user and context information with third party systems via pxGrid. This meant that you had to have ISE deployed everywhere to have full identity mapping on ISE, other Cisco Security tools, and ISE Ecosystem Partners. This was a bit of a problem: If the customer is rolling out ISE or it's not deployed everywhere, pxGrid really isn't getting a full picture of who is on the network to share with other tools. By adding other ways to add identity information to ISE, this solves the problem and allows ISE to share the username-to-IP mapping with pxGrid. After clicking Add, you will need to enter the join point name and domain name. It will then prompt you to ask if you would like to join the domain. You would need administrator credentials or credentials of an account that can join a computer to the domain. After ISE is joined to the domain, you will want to navigate to the PassiveID tab under the Active Directory domain. On here, you would indicate which domain controllers you would like to use for PassiveID. You can add new ones or use the existing one you just joined. Check the box next to the domain controller that's currently there and click Edit. On the pop-up, you would want to ensure that a domain admin account's username and password is configured and choose WMI from the dropdown. The next thing that you would do which is brilliant because it took a LOT of the manual work out of it is click Configure right next to WMI. This will cause ISE to reach out to the domain controller you selected and make the changes necessary to view the WMI logs. This greatly simplifies a task that used to be incredibly tedious. After you configure it, you can click the button next to it to test that it works. You should get a popup saying it works. Now let's say you don't want to use WMI and would rather use an agent? That's fine. Close out of the popup window and click on the Add Agent button. A new pop-up box will come up with the option to deploy an agent to the domain controller. You would need to give the FQDN of the domain controller and administrator credentials. After you do so, you would click the Deploy button and ISE would silently install it on the domain controller to run as a service in the background. From the popup window, choose Agent under Protocol and choose the name of the agent you previously deployed. Then click Save. Whether or not you decide to use WMI or an Agent, the deployment is made very simple compared to having to manually change registries and do a ton of backend work on your domain controllers. Not to mention the risk of human error that's involved. If you've followed my instructions up to this point, navigating to Work Centers>PassiveID>Overview>Live Sessions and you should see authentications coming in from endpoints that aren't just authenticating to the network via 802.1x. Note: In order to use EasyConnect, you would need to deploy a PassiveID provider using either WMI or the Agent. All other forms of PassiveID are used just for sharing context information between various other systems with pxGrid. Agents - This is just another tab where you can deploy the agent or you can download it to register it manually later. This can also be done from the Active Directory screen. Since we configured it both ways above, I won't rehash the same thing. To configure it, you would configure the IP or FQDN of the application and the username and password for the REST API. But in the event that does not work for you, you can click New and add your own syslog template for whatever system you are using. Again, there is no hard and fast rule you can only run PassiveID or 802.1x. If you are deploying ISE and have a mixed environment, you can have PassiveID be your fallback method. For the purposes of this configuration, I am going to spare the switch and basic ISE configuration. Nothing has changed from previous posts in regards to that. I'm just going to walk through the policy setup for EasyConnect. For my top-level condition for this policy set, I'm going to choose Device:Device Types equals Switches and just use Default Network Access. Click Save and then go into the newly created policy set. For the Authentication policy, we're going to choose Wired_MAB as the condition and Internal Endpoints (essentially anything seen by MAB) as the endpoint group. Remember: We're not authenticating via the network - we're waiting to see an authentication event via Active Directory. Under the Authorization Policy, I'm going to create a condition of PassiveID_Groups EQUALS AD1:securitydemo.net/Users/Domain Users to look for authentication for anyone part of the Domain Users group as part of PassiveID. 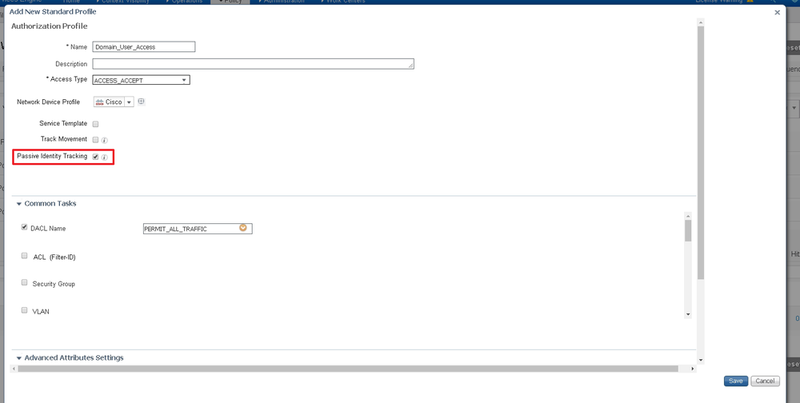 Next, click the + button next to Results Profiles to create a new Authorization Profile on the fly. On the Authorization Profile, name it whatever you would like and then check the box next to Passive Identity Tracking to indicate this will be used with PassiveID. Then choose whatever common tasks you want. After you have saved the policy set, you should be able to test out a login attempt and first see the endpoint profiled and getting AD access and then move to user access after a successful login. This is a screenshot of another deployment I did showing the successful login.